This seminar presents an in-depth understanding of the visual process and its direct relationship to neuromotor function. 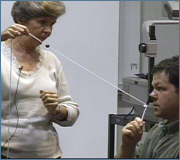 The visual difficulties of both children and adults are discussed in relation to their visual performance due to developmental disabilities or following a neurological event or head trauma. Emphasis is placed on the integration of intervention strategies as part of a total rehabilitation process. 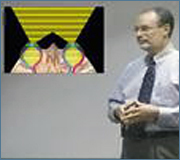 Topics include Relationship of Visual Development with Motor Function; Head/Neck Relationships to Vision-Posture Orientation; Developmental Concepts of Midline Orientation for Vision-Movement-Balance; Post Trauma Vision Syndrome; Visual Midline Shift Syndrome; Changing the Perception of Space; Ambient and Focal Visual Processes; Importance of Binocularity; Basic Screening Procedures; Intervention Strategies and the Use of Prism Lenses. Handouts included in PDF file format. 1. Describe a new model of visual function based on ambient-focal interrelationships. 2. 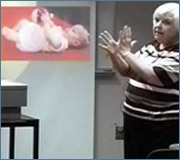 Describe the influences of visual interference and distortion on movement and postural control. 3. Identify basic visual skills. 4. Identify the primary characteristics of visual dysfunction. 5. 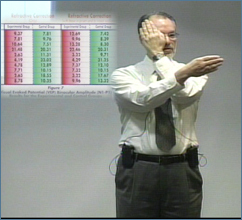 Describe the use of prism lenses to affect changes in movement and posture.